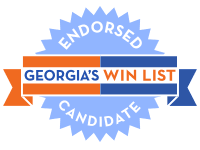 Georgia’s WIN List proudly endorses Sandra Workman for Georgia Senate District 1, where she hopes to unseat a Republican incumbent who hasn’t faced a Democratic opponent since 2010. The district includes Bryan County and parts of Liberty and Chatham Counties. Sandra has an undergraduate and a graduate degree from Florida Atlantic University and also holds a master’s certificate in Project Management from George Washington University. A Georgia resident for 18 years, Sandra has served as the Director of Information Security Program for Time Warner Cable, a Senior Manager for The Home Depot, and as a consultant for one of the U.S.’s largest public accounting and consulting companies, Deloitte Consulting. As an environmentalist, Sandra was on the Board of Directors and was the Vice President of The Dolphin Project, a Savannah-based volunteer group which focuses on environmental issues. Her frequent trips to Savannah led her to choose Savannah as her “retirement” home in 2015. “I will represent my constituents on issues which matter to all: putting Georgia’s economy on a path for the robust, sustainable growth which leads to job creation and prosperity, protecting our beautiful coastline from environmental ruin, introducing common-sense legislation to keep weapons out of the wrong hands, and enhancing the security of our voting system to ensure every vote counts,” Sandra says. ACCESS TO AFFORDABLE HEALTHCARE – “Healthcare is a human right, not a privilege,” Sandra says. She will work to expand Medicaid coverage which would provide around 240,000 Georgians with healthcare benefits and decrease the uninsured rate by half. Expanding Medicaid will produce a $3 billion annual investment of federal dollars back to Georgia. Sandra believes a lack of mental health programs combines with opioid abuse to destroy communities where residents can’t afford healthcare. EDUCATION – “Every child deserves a limitless future,” Sandra says. She is committed to increasing access to high-quality child care programs for ages birth to three, increased access to Pre-K, expanded after-school programs, and pay raises for teachers. She believes it is important to thoroughly fund public education and reverse efforts to “privatize” our schools. ECONOMIC GROWTH – For Georgia’s economy to grow, Sandra supports innovation and the diversification of the current job base. She believes that Georgia should be a leader in renewable energy and agritech. She pledges to work to increase the hourly minimum wage to $15 over time and believes no one working full time should be forced to raise a child in poverty. SAFETY & SECURITY – Statistics show Georgia residents are two times as likely to be killed by a firearm than New York residents. Sandra will work to introduce common sense legislation to keep weapons under control without diminishing Second Amendment rights. Georgia women like Sandra are making history in this midterm election cycle as they run for seats long held by Republicans. With women in record numbers on the ballot this year, WIN List needs your help to elect these women and train the candidates we want to see on the ballot in 2020.